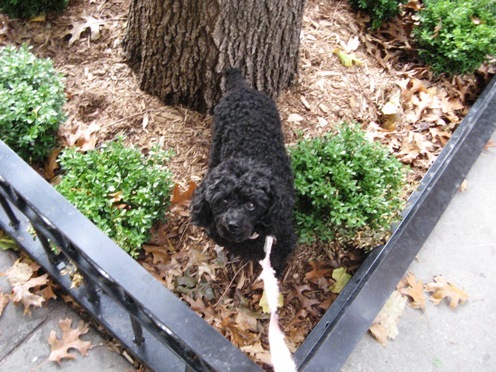 So last night I was walking Chloe, who never really likes to walk, as you have heard about once, or twice or ten times, and there, right in front of our building, I see this 20 something woman pick up her pooch (also a toy poodle) and put him in the fenced off tree to do his business. So I marched over with a proper amount indignence, pulling Chloe behind me, while at that second, her dog takes a poop. “Um, excuse me. They put that fence there so our dogs WOULDN’T crap or pee on the newly planted BUSHES.” “I PICK IT UP,” she says. And besides, I can’t control where my (8 pound) poodle goes.